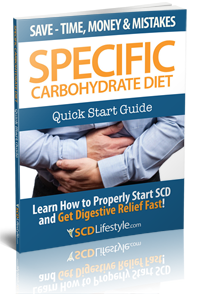 If you’re worried or overwhelmed about starting the SCD diet and afraid that you’re never going to naturally heal your gut, then this guide is the most important thing you’ll ever read. How to tell if the SCD diet is right for you…because it isn’t for everyone. A grocery store checklist to help you get started so you don’t waste money on things you don’t need. How to properly make all the food for the 2-5 day intro diet with detailed picture-by-picture instructions, so it’s not so overwhelming and you can start healing when you are ready. How to avoid the Number One mistake that causes people to QUIT before they start feeling better…mess this up and the diet will not work.